Bill Gray attended Collingwood Technical School from 1940 to 1942. He was in the school band and later became a school prefect although, to his shame, had to hand in his prefects badge when he was caught smoking at school – a somewhat understandable misdemeanour given that Bill’s father was a tobacconist! Bill’s time at CTS enabled him to start work as an apprentice electrical fitter and armature winder. He returned to CTS to finish his apprenticeship course as an evening student. 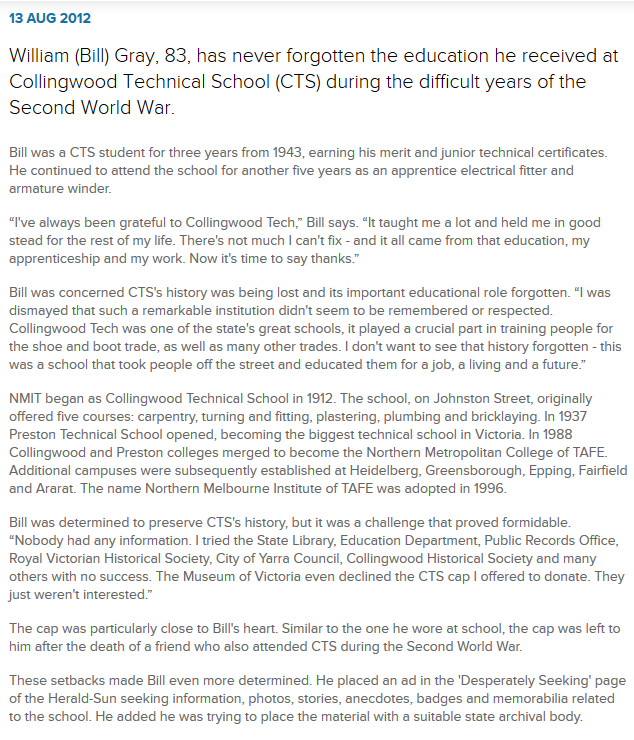 Bill is passionate about CTS history and has contributed material to the newly established NMIT historical archive.